What Made Susannah Cahalan’s Brain on Fire a Best-selling Memoir? You are here: Home / What Made Susannah Cahalan’s Brain on Fire a Best-selling Memoir? All classes are one hour and we record all sessions so that you can watch the recordings if you have to miss a class. 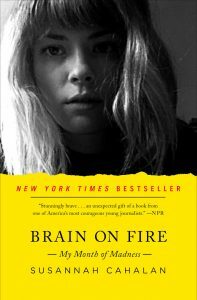 Brain on Fire (soon to be a major motion picture) set us on fire! This fast-paced memoir has a lot to teach memoirists about how to write what you don’t remember; the value of advocating for others through your writing; and the power memoir holds to truly change lives. Cahalan brilliantly captures her month of madness, despite the fact that she recalls almost nothing of what happened during that time. She uses effective techniques, like dropping into the point of view of others, incorporating records and journals, and excerpting bits from video sessions. In pushing the boundaries of memoir through the use of multiple “I” narrative voices, Brain on Fire is a valuable teaching tool to aspiring memoirists who want to better grasp the power of transformation—and how to bring your reader all the way into the story as you face your own struggles and setbacks, and areas of growth and transformation. Distinguishing between the real, the unreal, and the possibly real and why to make sure your readers know what’s what.